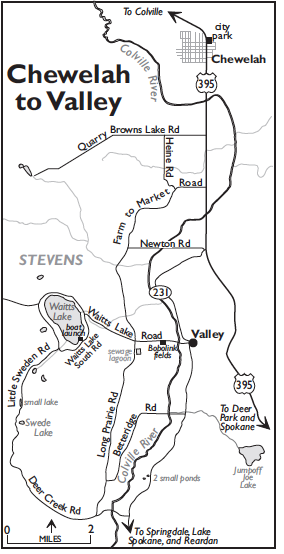 I received a 2nd hand note about access to the Colville Sewage Treatment Plan in Colville [Stevens Co]: "In order to help facilitate birders, the Colville STP is now open M-F from 7a to 3p. The gate will remain unlocked during that time This way birders will know when it is open. It's a new thing the STP is doing to accommodate birders." Newton Rd is signed as “Closed” due to water over the road west of the bridge over the Colville River. Not passable at this time. Early migrant waterfowl starting to show up in numbers- Northern pintail and swans (likely Tundra” but we’re seeing some Trumpeters lately). Newton Lane, between Chewelah and Valley, still has water running over the road west of the bridge over the Colville River. Signs at either end warn you. You can cross if your vehicle has decent clearance. Usually a good place to find bobolinks. Though none today. The entire Chewelah to Valley route (including Waitts Lake South and Little Sweeden Rd) was wonderful. We saw Bobolinks along Newton Road. We stayed at Nordlig Motel in Chewlah,which was fine, but the breakfast consisted of muffin, orange juice and coffee. Lincoln and Stevens Counties are separated by the Spokane River at SR-231. Southern Stevens County hosts some nice birding habitat featuring a few species that are easier to find here than in the northern parts of the region. White-throated Swift (there’s a colony in the bluffs above the Long Lake Dam), are often joined by one or two Vaux’s Swifts early and late in breeding season. Gray Flycatchers and Western Bluebirds are found in stands of medium or larger Ponderosa Pines on level ground. White-headed Woodpeckers are scarce but seen in these areas from time to time. Rock and Canyon Wrens are in the Basalt cliffs and scree along the Spokane River. Calliope and Black-chinned Hummingbirds, Veery, and Yellow-breasted Chat are found in the riparian habitat along creeks near their intersection with the Spokane River. 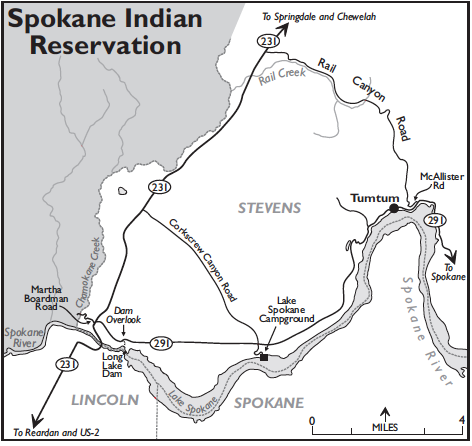 To reach the Spokane Indian Reservation, begin at the intersection of SR-231 and SR-291, travel about 100 yards south, and turn right (west) onto Martha Boardman Road. Drive 0.6 mile to Chamokane Creek. This is an excellent spot to find Willow Flycatcher, Red-eyed Vireo, Bewick’s Wren, American Dipper (winter), Veery, Gray Catbird, MacGillivray’s Warbler, Yellow-breasted Chat, and Bullock’s Oriole. Ponderosa Pine forest above the creek hosts Gray Flycatcher, Clark’s Nutcracker (irruptive), White-breasted and Pygmy Nuthatches, Western and Mountain Bluebirds, Chipping, Vesper, and Lark Sparrows, Cassin’s Finch, Red Crossbill, and occasionally White-headed Woodpecker. Because the roads are poorly marked, it is best to backtrack to SR-231 to leave the area. The intersection of SR-291 and SR-231 also provides the starting point to reach Lake Spokane (aka Long Lake), a boating and fishing reservoir that is drawn down in winter months. Go east on SR-291 one mile to the Dam Overlook. Take the short trail out to the overlook, where you cannot miss the Osprey nest right along the trail. In spring and summer, this is a reliable place to find White-throated Swifts, (Vaux’s occasional), flying with the numerous Violet-green Swallows. Rock and Canyon Wrens can be found along the cliffs. Peregrine Falcons sometimes make an appearance. Bald Eagles can be found near the dam in winter. Continue east along SR-291 for 3.5 miles to the Lake Spokane Campground (Discover Pass required; gate closed in winter). The fenceline along the entrance hosts Say’s Phoebe, Western and Eastern Kingbirds, Western and Mountain Bluebirds, and Vesper and Lark Sparrows. The campground itself can produce Gray Flycatcher, all three nuthatches, and Cassin’s Finch. The cliffs across SR-291 from the campground have Golden Eagle, Clark’s Nutcracker, and Canyon and Rock Wrens. White-headed Woodpecker has been seen in the area (rare). About six miles farther east on SR-291 is the little community of Tumtum, where you can look over Lake Spokane. While the lake is not great for waterfowl, the far eastern end attracts a rather large nesting colony of Western Grebes, which can be found easily anywhere on the lake in summer. Also present are Double-crested Cormorants, which can be otherwise difficult to find in Stevens County. In late fall, a number of gulls gather on the lake, including Bonaparte’s, California, and Herring—all three uncommon in the area. In winter, look for goldeneyes and mergansers. Rail Canyon Road offers a variety of habitats and species. A mile or so after you enter Tumtum, take McAllister Road (paved) north off of SR-291. McAllister becomes Rail Canyon Road (gravel). In the first four miles, you pass through dry Ponderosa Pine and Douglas-fir with birds typical of the habitat. About three miles from SR-291, Flammulated Owls have been found. Great Horned, Northern Pygmy-, and Northern Saw-whet Owls are also seen in the area, joined by Common Nighthawks and Common Poorwills in summer. Continuing on Rail Canyon Road, the habitat changes and species related to a wetter climate begin to appear. Orange-crowned, Nashville, MacGillivray’s, Yellow, Yellow-rumped, and Townsend’s Warblers all nest here along with Cassin’s and Warbling Vireos, Veery, and Swainson’s Thrush. The road joins SR-231 in 7.6 miles. The seven-mile stretch between the small towns of Chewelah and Valley can produce a staggering number of species almost any time of year. The wealth and diversity of habitat make this an exciting area to bird. Before beginning the route in Chewelah, check the city park (US-395 and Lincoln), which has hosted a pair of Merlins for years. Pygmy Nuthatches are common here, as well. The route begins south of the park at the intersection of Main Street and US-395. Travel south on US-395 for 3.2 miles, turn right (west) on Farm to Market Road, and go 0.7 mile to the intersection with Heine Road. A Prairie Falcon wintered near this intersection for two years. Behind two dark-blue silos here, a tiny wet area surrounded by weeds and brush is a sparrow magnet in the fall. In amongst the common Song and White-crowned Sparrows, this spot has yielded, over the years, American Tree, Fox, Lincoln’s, White-throated, Harris’s, and Golden-crowned Sparrows. As you continue south on Farm to Market Road, you may find Golden Eagle, Clark’s Nutcracker, and Canyon Wren in 1.7 miles on cliffs on the west side of the road, although pine forest obscures the view. Lazuli Buntings are common in the summer. In another 0.3 mile, is Newton Road, a short road that reconnects with US-395 and that should be checked in fall, winter, and spring. In spring, when the Colville River floods the adjacent fields, an impressive variety of waterfowl can be present. Greater White-fronted and Snow Geese occasionally join the abundant Canada Geese. Large flocks of Tundra Swans sometimes include a few Trumpeters. With a little patience, Eurasian Wigeon are found annually. In mid-April, Black-necked Stilt, American Avocet, Greater Yellowlegs, and, rarely, Bonaparte’s Gull appear. Lewis’s Woodpeckers have been spotted on three occasions in the few trees along the road. In fall and early winter, Northern Shrikes sit on the wires and small bushes, and Horned Larks and Snow Buntings are sometimes seen. In winter, numerous raptors, including Bald Eagles, Northern Harriers, Red-tailed and Rough-legged Hawks, and Merlins (uncommon) visit the area. At the intersection of Newton and SR-231 (at US-395), turn south and follow SR-231 to the small town of Valley. At Waitts Lake Road, turn right (west). In 0.5 mile, you will find an old unused metal corral. The fields across the road host an increasing nesting colony of Bobolinks. When water levels are adequate, the surrounding wet fields can yield shorebirds in spring and Black Terns in summer. In another 0.7 mile, is the intersection of Waitts Lake Road and Farm to Market Road (called Long Prairie Road south of here). The sewage treatment lagoons just south of the intersection are worth checking for waterfowl and shorebirds. Barrow’s Goldeneyes occur in spring and fall, Wilson’s Phalaropes nest here, and Red-necked Phalaropes are seen in August and September. From the intersection, continue west on Waitts Lake Road. In 1.3 miles, veer left onto Waitts Lake South Road and continue 0.6 mile to the public boat launch ramp (Public Fishing sign and guard rail). Red-necked Grebes nest on Waitts Lake. The best birding on the lake itself is in the fall. Scoters sometimes join the rafts of the more common species: Bufflehead, goldeneyes, Common Loon, and Horned and Western Grebes. Back on Waitts Lake South Road, continue south and west for another 0.3 mile to a riparian area filled with aspen and willows. There is a spot to pull over, but you’ll need to bird carefully from the road. Willow Flycatcher, Warbling and Red-eyed Vireos, Gray Catbird, and American Redstart are easy to find here. Common Redpolls occasionally can be found in winter. Soras and Wilson’s Snipes call from the grassy marsh across the road. Continue again on Waitt’s Lake South Road. In another 0.4 mile, turn left onto Little Sweden Road, a 3-mile-long road that can be very productive. Residents include all three chickadees and all three nuthatches along with Brown Creeper, Pacific Wren, and kinglets. Also present are Ruffed Grouse, Western Screech-, Great Horned, Northern Pygmy-, and Northern Saw-whet Owls, Hairy and Pileated Woodpeckers, Gray and Steller’s Jays, and Clark’s Nutcracker. In winter, Northern Goshawk, Bohemian Waxwing, Pine Grosbeak, Cassin’s Finch, Common Redpoll, and Evening Grosbeak can occur. Summer brings a whole different set of species that includes Calliope Hummingbird, Red-naped Sapsucker, Hammond’s Flycatcher, Cassin’s, Warbling, and Red-eyed Vireos, Swainson’s and Varied Thrushes, Orange-crowned, Nashville, MacGillivray’s, Yellow, Yellow-rumped, and Townsend’s Warblers, American Redstart, Western Tanager, and Black-headed Grosbeak. On the right side, two miles up Little Sweden Road, a small lake has Wood, Ring-necked, and Ruddy Ducks, Red-necked Grebe, Virginia Rail, and Common Yellowthroat. Back in Valley, be sure to check all the treetops in winter, as Sharp-shinned and Cooper’s Hawks and Merlins can often be found pursuing the many House Finches and House Sparrows. Where Waitt’s Lake Road intersects SR-231, head south on SR-231. In 1.7 miles, turn right (west) on Betteridge Road. The first mile of Betteridge Road crosses the Colville River and passes through hay fields that abound with raptors, especially in winter. Red-tailed Hawks are common, joined by numerous Bald Eagles, Northern Harriers, and Rough-legged Hawks. Northern Shrikes are present in winter, as well. In September and early October, Western and Mountain Bluebirds and American Pipits line the fences and power lines. Where Betteridge Road takes a 90-degree turn to the left, a pair of Say’s Phoebes often hangs out at the farmhouse on your left. Black-chinned and Calliope Hummingbirds frequent the feeder there. Along Betteridge Road, you can find House and Bewick’s (rare) Wrens, Gray Catbird, Cedar Waxwing, Orange-crowned, Nashville, and MacGillivray’s Warblers, Black-headed Grosbeak, Lazuli Bunting (numerous), and Bullock’s Oriole. Sparrows gather in large flocks along this road in the fall, and Western and Eastern Kingbirds are common. Dusky Flycatchers call from the forest. The small seasonal lake has Blue-winged and Cinnamon Teal, Wilson’s Phalarope, and sometimes Black Tern. Tundra Swans are present in the spring. Backtrack on Betteridge Road to SR-231 and head south 1.6 miles to milepost 68. Two small ponds on the west side of the highway are always worth a look (scope). Trumpeter and Tundra Swans (rare) favor the larger pond. Marsh Wrens can be heard fussing from the reeds. An American Bittern was spotted here once. The pond is a favorite in summer for Black Terns. 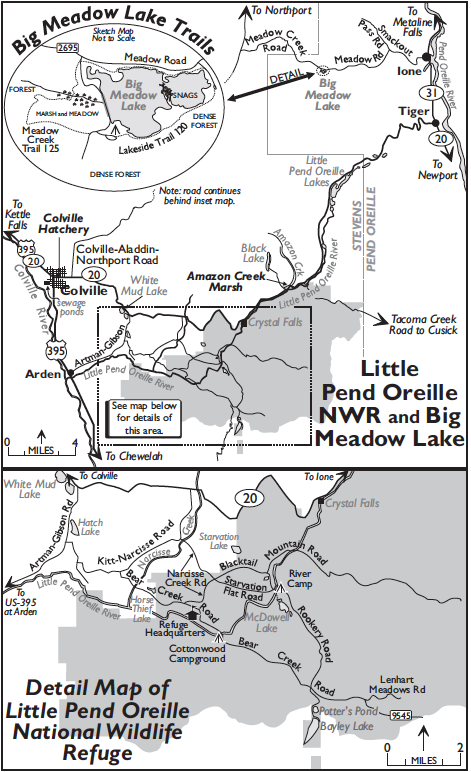 East of Colville lies an extensive forested plateau and mountain complex, crisscrossed by old logging roads and with many lakes, marshes, and streams. The forests on drier uplands are mainly composed of Ponderosa Pine and Douglas-fir. Poorly drained, wetter sites have Engelmann Spruce, Lodgepole Pine, and Western Larch. To reach this area, go east on SR-20 from the intersection with US-395 in Colville. In 0.4 mile (Hoffstetter Street), you might want to check the woods and brush around a county hatchery used for vocational education on the left, a patch of habitat with Pacific-slope Flycatcher, Red-eyed Vireo, and Gray Catbird. About five miles east of the hatchery is White Mud Lake, on the south side of SR-20 (limited parking). Look here for a variety of waterfowl, including nesting Common Goldeneyes. In another half-mile, turn right onto Artman-Gibson Road (brown sign for Little Pend Oreille NWR). In 1.6 miles, look for Mountain Bluebirds at the intersection with Kitt-Narcisse Road; then turn left onto this road, which meanders southeastward. In 2.2 miles, turn right (south) onto Bear Creek Road (gravel). Check Horse Thief Lake and marsh on the left in 1.0 mile for Ring-necked Duck, Pied-billed Grebe, Osprey, Bald Eagle, rails, American Coot, and Yellow-headed Blackbird. The 40,200-acre Little Pend Oreille National Wildlife Refuge, established in 1939, is one of the largest in the state—and one of the least birded. Given the diversity, extent, and quality of its habitats, this site should be a first-class birding destination. Large areas of unfragmented forest are interspersed with streams, lakes, wetlands, and meadows. Forest composition ranges from Ponderosa Pine at 1,800 feet elevation up to Subalpine Fir at 5,600 feet. Birding is most productive from the nesting season through fall migration (late May–early September). Hunting season runs from September through December. The road to headquarters is open year round. The rest of the refuge is closed off by gates from January 1 to April 14, but you may walk or ski in. Refuge headquarters is on the right, 2.2 miles from the Horse Thief Lake stop. Wild Turkey, Wilson’s Snipe, Black-chinned Hummingbird, White-headed Woodpecker, and five species of swallows are regular in this vicinity. In winter, you may see Pine Grosbeak, Cassin’s Finch (uncommon), Red Crossbill, Pine Siskin, and Evening Grosbeak; Common Redpoll occurs erratically. Continue east 0.8 mile along Bear Creek Road to Cottonwood Campground, on the right. Excellent riparian, marsh, and wet-meadow habitats make this one of the birdiest spots on the refuge. Breeding species include Olive-sided Flycatcher, Western Wood-Pewee, Willow and Dusky Flycatchers, Eastern Kingbird, Cassin’s and Red-eyed Vireos, House Wren, American Dipper, Veery, Varied Thrush, Cedar Waxwing, MacGillivray’s Warbler, Common Yellowthroat, American Redstart, Yellow, Yellow-rumped, and Townsend’s Warblers, Song Sparrow, Black-headed Grosbeak, Lazuli Bunting, and Bullock’s Oriole. Continue on Bear Creek Road for three miles, then veer off to the right onto a dirt road (Bayley Lake Road) that leads in 0.9 mile to an observation platform and interpretive display at Potter’s Pond. Marsh and pond are home to many birds, among them Ring-necked Duck, Common Goldeneye, Ruddy Duck, Willow Flycatcher, Warbling Vireo, Tree Swallow, Marsh Wren, Common Yellowthroat, Yellow Warbler, and Yellow-headed Blackbird. A few shorebirds sometimes appear here in fall migration. Moose also like this spot. The road continues another 0.2 mile to the north end of a large wetland and Bayley Lake, a good place for Common Goldeneye and other waterfowl. Ospreys and Bald Eagles nest at the south end of the lake. Bear Creek Road continues east from the Potter’s Pond turnoff, becoming FR-9545. In 2.5 to three miles, south of Lenhart Meadows and Bear Creek, listen for Flammulated Owl at night. Refuge headquarters is also the departure point to reach another rewarding birding road: Blacktail Mountain Road. From headquarters, turn back west along Bear Creek Road, then go right in 0.6 mile onto Narcisse Creek Road. Travel 1.1 miles and turn right through a green gate (closed in winter). The road forks immediately ahead. Starvation Flat Road (the right branch) leads to River Camp and McDowell Lake. The left branch is Blacktail Mountain Road. This dirt road should be passable to most vehicles, but watch out for soft sand and for wet and muddy spots. The road starts in dry Ponderosa Pine woodland, then proceeds eastward through areas that have been logged at various times, providing an interesting succession of habitats. At 7.6 miles, you reach moist, uncut forest of Engelmann Spruce, Western Redcedar, Western Larch, and Lodgepole Pine at about 3,600 feet elevation. Breeding species along this route include Spruce Grouse, American Three-toed Woodpecker, Hammond’s Flycatcher, Cassin’s and Warbling Vireos, Mountain and Chestnut-backed Chickadees, Red-breasted Nuthatch, Brown Creeper, Pacific Wren, Golden-crowned Kinglet, Swainson’s and Varied Thrushes, Nashville (in brushy clearcuts), Yellow-rumped, and Townsend’s Warblers, Chipping Sparrow, Dark-eyed Junco, Western Tanager, and Red Crossbill. You can drive this road eastward for several more miles, eventually reaching a divide at 4,900 feet elevation, where Dusky Grouse and Boreal Chickadee (rare) can be found. Back at Narcisse Creek Road, a right turn brings you to Kitt-Narcisse Road in 1.7 miles. Turn right again to reach SR-20 in 1.4 miles. From this intersection you can turn left to reach Colville in about nine miles. If you wish to go east toward Tiger, turn right from Kitt-Narcisse Road onto SR-20. Travel 8.9 miles and turn left onto Black Lake Road. Then make an immediate right onto Spruce Canyon Road, which follows the north side of Amazon Creek Marsh, at the confluence of Amazon Creek and the Little Pend Oreille River. At the fork in 0.3 mile, bear right to loop back to SR-20 in 0.4 mile. The extensive alder-and-willow marsh is excellent for American Bittern, Wilson’s Snipe, Vaux’s Swift, Willow Flycatcher, Red-eyed Vireo, Ruby-crowned Kinglet (spruces at the marsh edge), Gray Catbird, Northern Waterthrush, MacGillivray’s Warbler, Common Yellowthroat, American Redstart, and Fox Sparrow. Continuing east and north, SR-20 follows the Little Pend Oreille River, eventually joining SR-31 at Tiger (17.5 miles); turn left here to reach Ione in about three miles. For much of this distance, SR-20 runs past the Little Pend Oreille Lakes, a chain of lakes given over to resorts and recreational activities. The large surrounding area, served by numerous roads and trails, is managed by the state Department of Natural Resources and the U.S. Forest Service for off-road-vehicle use. Depending on your (and their) tolerance for noise, dust, and hurtling ATVs, you may find Spruce Grouse, Flammulated and Barred Owls, and American Three-toed and Black-backed Woodpeckers nearly anywhere. Ospreys nest near some of the many small lakes, and Red-necked Grebes and a few waterfowl may nest on quieter waters. One of the birding jewels of the Northeast, Big Meadow Lake is also a popular weekend destination for local residents, so you may find it quieter on weekdays. Coming from Colville, turn north from SR-20 onto Colville-Aladdin-Northport Road (signed Aladdin Road) on the east edge of town, across from the airport. Look for Wild Turkeys in the fields as you drive up the picturesque valley for about 20 miles to the intersection with Meadow Creek Road (brown sign for Meadow Lake). Turn right and follow this gravel road to the entrance to Big Meadow Lake Campground, on the right in 6.2 miles. Coming from Ione, go west from SR-31 in the middle of town on Houghton Street. In 0.4 mile, turn left onto Eighth Avenue and go 0.1 mile to Smackout Pass Road (aka Blackwell Street). Turn right and head west out of town. In 2.7 miles is an intersection with Meadow Road, on the left (sign to Meadow Lake). Follow this road south and west 5.0 miles to your first view of Big Meadow Lake, a trailhead pullout on the left. A variety of waterbirds should be present. The entrance to Big Meadow Lake campground is 0.4 mile farther, also on the left. Big Meadow Lake enjoys a beautiful setting with a variety of habitats and a high diversity of breeding birds. In the low and boggy terrain are Engelmann Spruce-dominated forests with a diverse shrub-and-moss understory, very boreal in character. Uplands have Lodgepole Pine and Douglas-fir, Mountain Alder, and willow thickets. Nearby are extensive grass-and-sedge meadows. An island toward the east end of the lake is studded with snags, ideal for nesting ducks, woodpeckers, and swallows. This is one of the few sites in Washington where Buffleheads and Common Goldeneyes regularly breed; Barrow’s Goldeneyes also breed here. The wails, grunts, and cries of Red-necked Grebes break the peaceful atmosphere in summer. Common Loons are also frequently seen, though breeding here is rare, probably on account of human disturbance. At the alder-dominated swampy lake edges, especially near the campground, the staccato song of Northern Waterthrush is frequently heard. American Redstart is a less-common summer visitor. Trails around the lake and at the west end of the lake provide opportunities to find a plethora of species including Spruce Grouse, Barred Owl, American Three-toed Woodpecker, Olive-sided and Willow Flycatchers, and Lincoln’s Sparrow. The Colville Sewage Lagoons are one of the best shorebird hotspots in Eastern Washington. The lagoons are located on the west end of Colville. From downtown Colville, head west on First Street, cross the railroad tracks, turn left onto Louis Perras Road, and continue south past Oakshott Road. Chances are you will find the gates to the facility locked. At this time, the very friendly staff at the office are willing to open the gates between 8AM and 3PM, Monday through Friday. Besides the shorebirds, the lagoons also attract a number of waterfowl, Black Tern, Merlin, and Peregrine Falcon. In spring, the flooded fields along Oakshott Road draw waterfowl (including Eurasian Wigeon) and shorebirds, including American Avocets and Black-necked Stilts.